since a couple of versions of the EHC I have an odd behaviour in my Safari browser. I can edit a VM without any issues the first time after I´ve logged in. The only way to get rid of the message and be able to edit VMs again is to refresh the whole browser window/tab. Then I can edit (or even create) a VM exactly one time and need to refresh again. Only happens in Safari on OS X. Tested with Windows 7 and Chrome too, works like a charm there. This is interesting. I have had another user with the same issue. However, I am unsure how the VM is configured with a large negative limit on the memory. It is not possible to do this via the normal API reconfigure mechanism. I am going to try to include a fix for this in the next release. Actually, from your screen shot, it appears that the edit settings dialog hasn't loaded correctly. All of the dropdowns are empty. I am having trouble reproducing this with Safari 9.1.3. Does it happen every time you open this VM? Does it happen with other VMs? to reproduce the error message I simply have to log in, click the edit button of any of my VMs, click save OR cancel and click the edit button again and pops up. It also affects the VM creation because most parts of the form are used there too. Means I can create one VM successfully, if I want to create another one I also have to refresh the browser window/tab, otherwise I would hit the error again. Safari and OS X versions have also changed within the last months so I only wrote down what I currently use. Yea interesting. I'm using the same version of OS X and the same version of Safari, and I can't for the life of me reproduce this issue. To be clear, I have seen this sort of thing before with Safari, and I was able to reproduce, and I had thought it was fixed. Can you look in the Safari error console and see if there are any errors? Indeed there are a few errors in the error console but already after I´ve logged in, not while the error occurs. The latter one I see in Chrome too. Same problem here. MacOS Sierra 10.12 and Safari 10.0. Reopening the 'edit' screen produces a Memory limit doesn't accept the negative value -1048576 error. This was also in the previous OS X and Safari error. Reloading the page (cmd + R) fixes it, then I can reopen the edit screen and make changes. Little late to the party but this still occurs for me in 6.5. Same behavior as above exactly. Hi Joshua, thanks for reporting. I am able to reproduce this _sometimes_ and unfortunately, it's not clear to me what the problem is. There is no error reported, the symptom is basically all dropdown boxes fail to initialize. It's annoying, I know - and I am going to spend some more time trying to figure it out. Due to lack of 6.5 support of Photon Controller I staged my ESXi host today with the base image ESXi600-update2 (build 3620759). I did a default installation and didn´t touch anything else yet. Just created a VM (Linux, Other 64bit) and I was able to change settings without any issues a couple of times. Afterwards I installed patch ESXi600-201605001 (build 3825889) and made a reboot. As soon as the host was up again I was still able to change VM settings more than just once. Next patch was ESXi600-201608001 (build 4192238) also followed by a reboot. Guess what happens since then? Exactly, the same issues like described in this ticket. Just in case it would be some Safari extension or whatever I´ve installed also a VM with macOS Sierra and just opened Safari. Same result. Hi Gregor - thanks for providing this additional info. I have a couple of things to try. I'll keep this thread updated. Yet another victim of the same bug here. ESXi 6.5, Fling 1.16.0. ESXi runs on a MacPro, the web client on a MacMini (macOS 10.11.6, Safari 9.1.3). also an issue with Firefox 52 on Ubuntu 16.04, ESXI 6.0.0 Update 2 (Build 3620759). Nothing obvious in the console logs using Firefox inspector. Same problem here. Safari 10.0.3 on OS X 10.11.6 and whatever the latest version of Safari I on MacOS Sierra. I believe I've even encountered this issue in Chrome on Windows, but at the moment I'm unable to reproduce it. Same issue here on ESXi 6.5.0 (Build 5224529). If I use Firefox (52.0.2) or Edge, I can reproduce this while IE11 works without any issue (no difference between Windows 10 Anniversary update and Windows 10 Creators Update). I don't need to reload the complete tab, but have to click on edit several times until it load correctly. The issue is worst in Edge where it appears almost every time, followed by Firefox where it appears very often but lower times than on Edge. Thank you for taking the time to report on this issue. Clearly there is an issue here and we need to spend some time getting to the bottom of it. I will raise this with my team members and we will work on it. Just to add that I am facing same issue with ESXi 6.0 and using Chrome as a Browser.. I'm having the same issue with ESXi 6.5.0 and Chrome 43.0.2357.73 on Linux. I also consistently run into this issue, with ESXi 6.5.0 (Build 4887370) and Safari 10.1 (12603.1.30.0.34) on macOS 10.12.4. ESXi-6.5.0-20170104001-standard (VMware, Inc.), firefox 53.0+build6-0ubuntu0.17.04.1 on kubuntu 17.04. Find a "workaround". At this time, work well. Faced the same issue with Firefox / Chrome / Vivaldi / Internet explorer. All on latest version. I did not take time to troubleshoot properly but it seems to be a cache issue. For Internet Explorer : Internet Options > Browsing History - Settings > Check for newer versions of stored pages : Every time I visit the webpage. It will force to not using cache (not sure at 100%). Work well for me since a week. Same issue here, I tried every browser in Mac, Linux and Windows. It was worse on 6.5.0a build 4887370 and seemed to be related to security patch updates on the browsers. I updated to 6.5.0d build 5310538 and that seemed to resolve this issue until I was trying to demo to a client and it reared it's ugly head once more. The issue isn't quite as bad as it was I can close and re-open the edit window 1-5 times and it will work where in the previous build it totally crashed the page however if you left that page open and launched it in another tab it would work just fine. UPDATE: Just updated to 6.5.0u1 build 5969303, sadly still have the issue. Freshly installed ESXi, 6.5.0 Update 1 (Build 5969303) verified same problem. I too faced the same symptoms using a nested ESXi 6.5 Update 1 (Build 5969303)with FireFox 54.0.0 (64-bit). If I refresh the page, the Edit VM page loads correctly without any issues. Haven't installed the fling, just the one bundled with the official supported ESXi release. I made some changes that seem to have resolved this issue. Can you please try version 1.23.0 and report if you still have issues? I was able to edit 20 to 30 VMs without any issues. I still encounter another issue during the creation (the same screen where the VM specs are configured) of a new VM telling me 'The portgroup for Network adapter 1, VM Network, could not be found. It has been assigned to VM Network.' once I created a VM or simply go back and forth during the creation but seems not related to this one here so I´m going to create a new bug. I´d suggest to wait for some further feedback from the others and then close it. I have the same issue. It only happens if I have my dell h200 sas controller passthrough active. If I set passthrough to disabled if works correctly. I also tested with a netapp sas controller first and the same thing happened. Every ESXi box I have does this. It seems if you set the memory limit to "unlimited" it inserts a large negative number, this is indicative of an overflow condition in the underlying software. Same issue on Firefox and its annoying. Found a workaround. root > settings > reset to default and it works for time being. Can you confirm which version and build number of Host Client you are using? This can be found in the Host Client's About dialog. I am also having this issue, happy to assist in troubleshooting. As for reproducing the issue, I've found that upon refreshing the page the first time I go into a VMs 'Edit' settings it works fine, then after that regardless of whether I 'save' or 'cancel' it displays the Negative Memory value, refreshing the page is then required to access again. Can you try with the version available from this site? Hi, i am experiencing this problem on a new ESXi 6.5 install. It affects Firefox and Chrome on Ubuntu Linux. Just tried your esx-ui vib from this site, still same issue. Details : Firefox and Chrome , error is always same the memory limit field is populated by the same negative number = -1048576 , most drop down fields are blank , sometimes memory allocation is blank , have to backspace and leave empty the memory limit field then "click save" before trying again with the edit button , once you have cleared the negative number and "saved " the config we can edit again. the clear browser cache and reload entire browser only work occasionally . the "cleared field" approach works every time, at least for me. The server I am working on is non-production , so if we need to test stuff , count me in . Hi Madhav, can you confirm from the Help -> About dialog that you are indeed running the latest version? I literally get this all the time with ESXi 6.5. I have to close the browser tab and re-open it in order to be able to edit the VM properties again. It happens on Windows 10 and Windows 7 with Firefox and IE, Chrome just crashes, also on my Macbook with Safari. It's REALLY annoying. Don't have the issue with vCenter though. Would you be able to confirm the host client version you are using? You can find it in the About -> Help dialog. I am using Build 4887370. 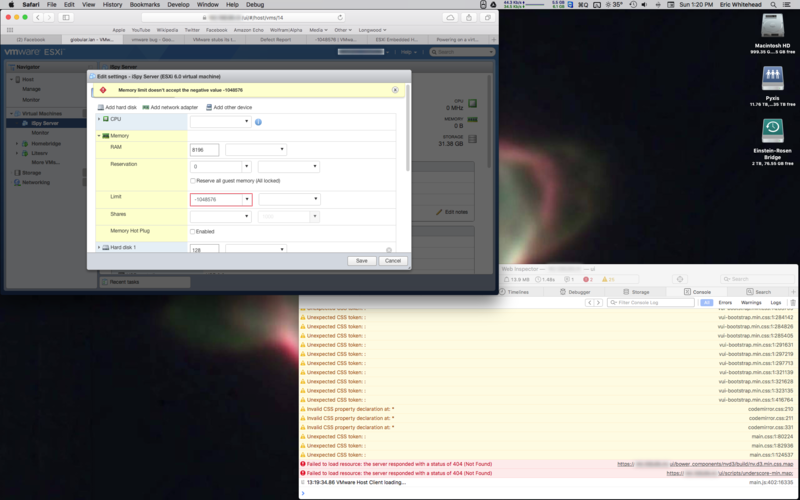 I use an iMac and safari/chrome to access the esxi server. My workaround is win + R to reload browser tab. I've got this problem after I've upgraded ESXI from 5.5 to 6.5. Hi Madhav, thank you for reporting back. Same problem on 3 x esxi bare metal and one nested in workstation. Firefox 57 - Windows 10 Pro. I am going to try updating shortly as I can see others on newer versions. ahh, I read the wrong bit, it appears I am on the latest, it was client version on other comments that were higher. I look forward to a fix. This server is not in production just for testing. Get this error in Edge chrome and firefox. Can you please update to the latest Fling version 1.24.0 from this site and check whether you still see this issue? Thanks! i'm having teh same issue with a freshly installed standalone esxi HP server using "VMware-ESXi-6.5.0-Update1-6765664-HPE-650.U1.10.1.5.26-Oct2017"
"esxcli software vib update -d " on both .vib files provided give a metadata error (install did the same), but the esxui-offline-bundle-6.x-7119706.zip bundle worked. i'm using FF 56 on windows, issue also appears on edge. The problem also shows when creating a new VM, once i reach the properties page all content is empty with yellow warnings. In the Firefox 58.0.1. (64 bit) problem isn't solved when creating new VM. Error "The portgroup for Network adapter 1, ......., could not be found, it has been assigned to ......"
I have exactly the same issue on Firefox 58.0.2 (64-bit) with ESXi 6.5.0 (installed from VMware-VMvisor-Installer-201701001-4887370.x86_64.iso). Really easy to reproduce. Click on a virtual machine, then on Edit. The dialog window pops up fine. Click Cancel, then click on Edit again. Then the problem shows up. I have to refresh the page to make the problem go away. Internet Explorer 11.248.16299.0 does not exhibit the problem. Firefox 57.0 has the problem. Firefox 45.7.0 does not have the problem. In all cases where the problem occurs, the replication steps are the same. Updating the UI to 1.24.0-7119706 using the Fling from this website seems to have cured the problem for me (I did not try this before - sorry, I'm a newbie to ESXi and only just read what Flings are and how to use them).